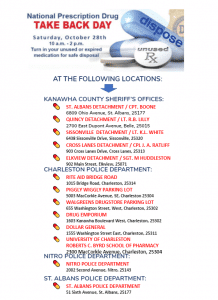 Kanawha Communities That Care is proud to support the 14th Annual National Prescription Drug Take Back Day. It is scheduled for Saturday, October 28, 2017 from 10-2:00 p.m. Various locations in and around Kanawha County are participating. Please review the list and participate. Call 304-437-3356 for more information.